Apologies if there’s been a similar thread, thought it’d be cool to list what we’re reading currently. I’ve been ‘trying’ to finish Indestructible Hulk since December. I read comics when I can, but collect more than I finish. This Hulk storyline sold me for two reasons, 1. Banner & Hulk at peace with each other, & 2. Hulk/Banner as a SHIELD operative was an intriguing idea. I had just finished the Secret Avengers series (all volumes) and dig the tactical applications of Avengers on spec ops. Like the Ultimates or GI Avengers. There was a lineup where they even listed each roster member with their specific team specialty. Needless to say the series went south with writer changes. One volume had added Hulk & War Machine/Iron Patriot for heavy artillery/support. I felt Indestructible Hulk helps pick up the special missions potential there. Last edited by Sender; 01-31-2018 at 10:06 PM.. I just added Gail Simone's new Domino title to my list too. I just read the first volume of Monstress by Marjorie Liu. Fantastic story and incredibly beautiful art, I recommend it. In terms of setting and worldbuilding it gave me a lot of Conan/R.E.Howard and Lovecraft vibes. All series i enjoy and probably 3 or so nights a week i make time to read them. I just finished reading the Marvel digital first Jessica Jones: Purple Daughter #2 on Comixology. I am so enthusiastic about this title. If you have any interest at all in Jessica Jones and/or Luke Cage, go read this series by Kelly Thompson. Trade paperbacks are out of the first story arc. It's funny, it's dark, it's well written and the art by Mattia de Iulis is beautiful. Avengers: No Road Home is really good. Things i've heard were good..and am looking to try..
i just finished Infinity from 2013. Pretty good story. 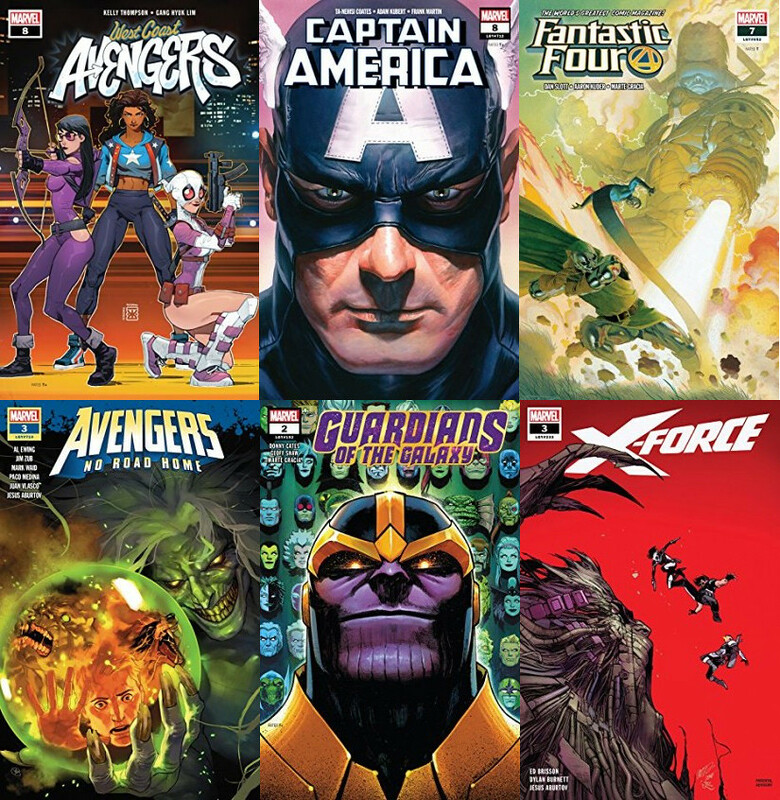 Re-reading Thanos (2017) 1-18 because i never finished the last three issues. i'm def interested in Jessica. I read the original Bendis run wayy back. It's every bit as good as the original Bendis run in my opinion, and much better art. just snagged these...all getting read between today and tomorrow..
Guardians of the Galaxy - I'm into Cosmic books/stories now so it's great that i was able to jump on this at the beginning. Lots of heavy hitters in these pages. Not much actually happened in this issue to push the story along, it seems it was more to set up and get a feel for the players involved and\or their relationships. I'll be following this book for awhile. X-Force - I just jumped in with this issue so I'm kinda clueless as to what was going on. i KNEW there was a younger Cable now (which i'm not sure if i'm a fan of as Cable was one of my fav characters) and while i don't know the story behind this younger version, they did touch on that topic a bit here in trying to figure him out. Ahab was in this and i haven't seen him in a long time. As much as i LOVE the idea of X-Force, I'm not sure I'll keep reading this. I may try the next issue and see if it helps any. Last edited by DarkToyLord; 03-05-2019 at 06:39 AM..
Kamala Khan/Ms Marvel is getting a relaunch this week with a new writer, Saladin Ahmed in Magnificent Ms Marvel #1, a good point to jump in if you have any interest in checking out one of Marvel big contemporary stars. Used a $10 eBay coupon I got on the Spirits of Vengeance miniseries from last year(?) and it was a solid read. The art for Ghost Rider was a little wonky and didn't look anything like the cover though. And I probably would've called it the New Midnight Sons or something that's what the group felt like but it was still fun nonetheless. did you read this yet...?? i saw it today and want to check it out. Not yet, I'm a couple of months behind with my comics. But it's getting extremely good reviews as far as I can see. Last edited by uchikuri; Today at 11:01 AM..